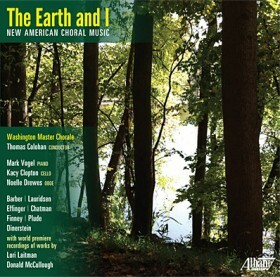 The Washington Master Chorale’s first compact disc, The Earth and I, features two pieces commissioned by the Chorale. Lori Laitman’s expressive cycle of “word paintings,” The Earth and I, based on poems by Emily Dickinson and Donald J. McCullough’s The Eye Begins to See, based on the poetry of Theodore Roethke, anchor a recording that explores humankind’s relationship with nature. The 19 tracks feature some of America’s most celebrated poets and composers and move seamlessly from the purely whimsical (Norman Dinerstein’s “An Old Silent Pond”), through darkness, and introspection (McCullough’s The Eye Begins to See), to arrive, finally at tranquility and spiritual enlightenment (Stephen Chatman’s “On the Beach at Night Alone”). Throughout, the nuanced artistry of the Washington Master Chorale shines through. Lori Laitman’s “The Earth and I” is published by Enchanted Knickers Music (BMI). Patricia Plude’s October is available direct from the composer. Donald McCullough’s “The Eye Begins to See” is published by McCullough Music Press. Stephen Chatman’s “Nature Songs” is published by ECS Publishing. Norman Dinerstein’s An Old Silent Pond is published by Carl Fischer, Inc.
Cecil Effinger’s “Four Pastorales” are published by G. Schirmer, Inc.
Kirke Mechem’s Loveliest of Trees is published by Beekman Music, Inc.
Ross Lee Finney’s See How the Arched Earth is published by Henmar Press Inc.
Morten Lauridsen’s Sure on this Shining Night is published by Songs of Peer, Ltd. This recording was made possible by a generous gift from Diane Kresh in memory of David B.G. Kresh. Additional kind support was provided by Dr. Adelaide Whitaker and an anonymous donor. The chorale joins Musica Viva NY and the New Orchestra of Washington to commemorate the 100th anniversary of WWI featuring the world premiere of a new work by American composer Joseph Turrin. A concert of seasonal carols and anthems featuring Czech American composer Václav Nelhýbel’s Estampie Natalis (“Birth Dance”). The Children’s Chorus of Washington joins the Chorale on a musical journey between two of the capitals of western art music. Photos, audio, and video by Arts Laureate. Concert images by Diane Kresh. Website design by Elizabeth Fulford.